Did you try to disable update in Windows 10? We know it is a huge problem at this time in the world. LOL ! 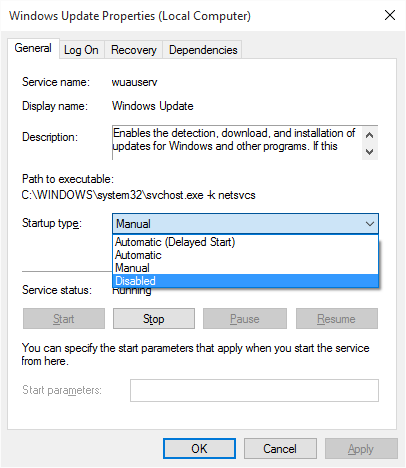 In this article, we are going to see that how we can disable windows 10 updates. There is no option to turn off or disable Windows Updates in Windows 10, as it used to be with earlier versions of Windows. You can do this by windows disabling the Windows Update Service. From Control Panel > Administrative Tools, you can access Windows Services Manager. In the Services window, scroll down to Windows Update and turn off the Service. To turn it off, right-click on ‘Windows Update‘, click on Properties and select Disabled in Startup type dropdown. Now from this feature, Windows 10 Updates not being installed on your PC or laptop. That’s all !